A little kid, adamant on meeting Salman Khan, turned up outside the sets of Bodyguard and did not budge without meeting the superstar. Salman Khan’s fan base has been swelling by leaps and bounds and the legion consists of fans from all age groups, from little kids to ageing housewives. But one would bow to the determination of a moppet who, accompanied with his parents, showed up on the sets of Bodyguard and asked to meet Salman. However, Salman was busy shooting for Bodyguard which is slated to release on August 31. Since only few days remain for the release, the shoot had been progressing at neck-breaking speed and Salman hardly had any time to look around and take out time for the fans. 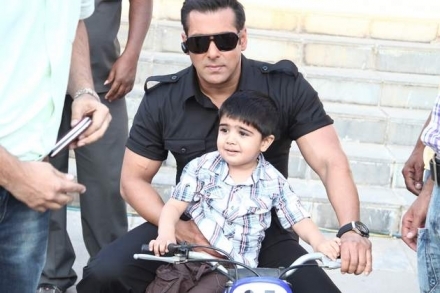 But the little kid also proved that he’s a true Salman fan. Upon learning that Salman is busy shooting, he did not budge but reportedly waited for as long as eight hours before the shoot got over.